Looking across the state at Jim Owens’ successful Washington program, Cougar backers saw a maniacally conditioned team that reflected confidence and spirit in hard-nosed physical play and multiple trips to the Rose Bowl. Thus they reached out to Robert “Bert” Clark, Jr., Owens chief assistant. 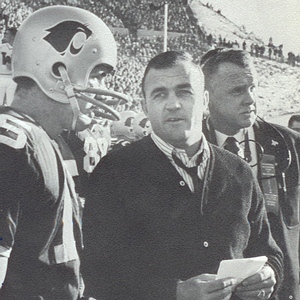 Like Owens, Clark was a product of Bud Wilkinson’s championship Oklahoma teams, leading the 1950 National Champions from his linebacker position and he coached in a manner that reflected his and Owens’ playing style. He expanded his coaching knowledge at Arkansas before going to Washington with Owens and he planned to bring the same type of intense and relentless brand of football to Pullman. He introduced a distinctive crimson cougar decal outlined in white that was applied to both sides of the team’s new silver helmets. Clark opened with a heart stopping 29-23 victory over Stanford when All American HB Clarence “Clancy” Williams stole the ball to set up the WSU winning drive late in the game. Williams was terrific all season and became the Rams number one draft choice, one that paid off nicely as he patrolled their defensive backfield for eight seasons. When future San Diego State All American QB Don Horn transferred to Don Coryell’s program, that hurt the offense but Larry Eilmes was a find at FB and Gerry Shaw again led the receiving corps. Shaw had a ten year career as a DB and receiver with Calgary in the CFL while tackle Wally Dempsey became one of the all time great linebackers for Saskatchewan in a career that lasted eight seasons. Clark’s 3-6-1 debut matched Sutherland’s final season but everyone was optimistic. Following in the footsteps of his foster brother George Reed, Clancy Williams was another Reston High School prospect that paid big dividends in Pullman. Considered by many to be the finest two-way player on the West Coast both during his playing days and perhaps of all time, he was an All Conference, All Pacific Coast, and Consensus First Team All American as a senior. He served the Rams well as a defensive back and feared return man utilizing his 9.6/100 track speed. He was usually assigned to stop the opponent’s best receiver and led the Rams in interceptions much of his career. Williams unfortunately died at the age of forty-three, the victim of cancer but remains on the All Time Cougar teams with many believing he should be in the College Football Hall Of Fame. 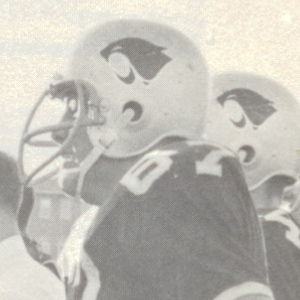 The ’65 squad earned their nickname “The Cardiac Kids” as they defeated three Big Ten opponents by close scores and remained in the Rose Bowl race until the season’s final week. QB Tom Roth was the PAC 8’s leading passer and Eilmes one of the conference’s top rushers, setting a school record with 194 yards against Villanova. His 818 career yards was the WSU record to that date. A fan favorite who later continued his career with BC of the CFL in 1966 and ’67, he helped win the Minnesota game by fracturing All American end Aaron Brown’s jaw on a great special teams hit! The defense was tough all season, led by DT Wayne Foster and DB Wayne Gaskins, both All Conference choices and both went on to play in the CFL. The final 7-3 record fell just short of the 7-2-1 of Rose Bowl pick UCLA but Clark put the tough, hard hitting team he wanted onto the field each week. In 1966 starting QB Mike Cadigan was first criticized and then banished to the secondary after the opening game 21-6 loss to CAL, setting the ominous tone for the 3-7 season to follow. Jerry Henderson stepped in and his ninety-five completions, fifty-four of them to All PAC end Doug Flamsburg, made them the best pitch-and-catch combo in the West. Becoming part of history, the September 23, 1966 game against Houston, a 21-7 loss, was the very first game ever played in the new Astrodome. Canadian born fullback Ted Gerela whose brother Roy won fame as a kicker with the championship era Steelers, played with distinction in Canada and became that league’s first kicking specialist. All Conference center Ron Vrlicak teamed with super guard Dave Middendorf to provide the pass protection and tough NG Bob Trygstad put his talent to use for Montreal in the CFL.